The Proof Is in the Pudding by Melinda Wells, a Mysterious Review. 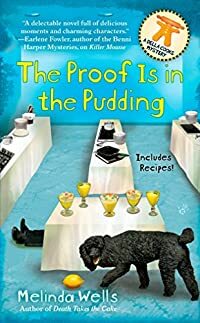 Review: Cooking school owner Della Carmichael, also the star of her own cable channel cooking show, agrees to judge a celebrity cook-off … but has second thoughts when murder is on the menu … in The Proof Is in the Pudding, the third mystery in this series by Melinda Wells. Life is good for Della. Her school is going well, she has a mail-order business called "Della's Sweet Dreams", and her cable show In the Kitchen with Della is a hit. The head of publicity for the network asks Della to participate in judging the Celebrity Cook-Off Charity Gala, in which twenty celebrities, all amateur chefs, prepare their favorite dishes. Her fellow judges are Keith Ingram, syndicated food columnist, and Yvette Dupree, bestselling author of a series of global gourmet books. But before the judging can begin, LAPD officer John O'Hara confronts Keith — known to some as a "bad dude" — and knocks him to the ground. It seems Keith had dumped John's daughter Eileen to marry Tina, the daughter of wealthy Eugene Long, sponsor of the cook-off. When a smoke bomb is thrown into the room, there's a brief panic among the judges, chefs, and spectators … and when the smoke clears, Keith is found dead, lying in a pool of blood from a knife wound to the throat. Naturally, John O'Hara is the prime suspect. But Della, who is friends with his daughter Eileen, is told that Keith kept a hidden camera in his bedroom and had videotaped their love-making. In an effort to protect her friend, Della breaks into Keith's house, stealing the tape. But she wasn't all that careful, as the police find her fingerprints in the house and begin to believe she may have had a reason herself to kill Keith. Della and John, now both suspects, decide to team up to find evidence that will clear their names. The Proof Is in the Pudding is a delightful culinary mystery. The main ingredient (as it were) is the central character of Della Carmichael, who is an entertaining, smart, endearing protagonist. The whodunit plot is nicely paced with credible suspects and good misdirection, the killer's identity remaining unknown until the end. And after the story concludes, there's still more: the reader can enjoy preparing the delicious recipes provided at the end of the book. Special thanks to guest reviewer Betty of The Betz Review for contributing her review of The Proof Is in the Pudding. Acknowledgment: Melinda Wells provided a copy of The Proof Is in the Pudding for this review.